Even moreso than recipes from celebrity cooks, I love to prepare recipes belonging to just plain celebrities who may or may not be known for their cooking. 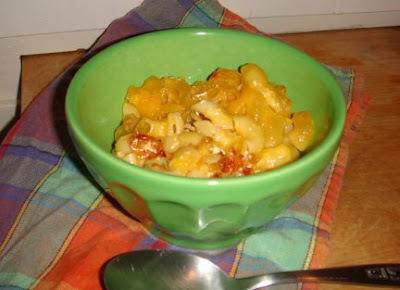 Nancy Reagan's macaroni and cheese recipe is one I've been meaning to try. The recipe was published in Favorite Recipes of America Casseroles (1968) when, officially, the contributor was "Mrs. Ronald Reagan, Wife of Governor of California, Sacramento" -- at least poor, nameless Nancy got "Wife" capitalized. I find it hard to imagine her actually preparing this, although I do love the idea of Ronnie hinting, eyes all a-glint and head tilting, "Mommy, I sure could go for some of your cheesy macaroni casserole!" 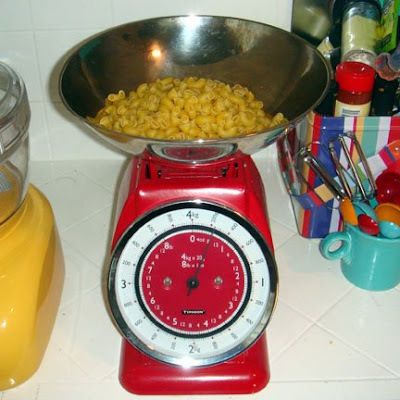 Enzo is especially handy when it comes to mac and cheese prep, because I recently purchased the world's largest bag of elbow macaroni and must measure the correct amount for each recipe. Nancy Reagan's macaroni and cheese is different from Martha's in that it does not involve a white sauce. Instead, you cook the pasta, stir in the cheese and spices, place it in a baking dish and then pour cold milk over everything. The milk is absorbed during baking. Unfortunately, it does not magically emulsify the cheese to form a creamy counterpoint to tender pasta. No, in fact the whole thing turns into a cacophany of warring textures. The whole top layer of noodles is rubbery, except the tippy-top bits which are downright crunchy and not in a good way. The cheese exists as melted blobs clinging to each other and exuding an orange ooze that can really ruin a girl's day. In all fairness, my preparation of Nancy's mac was marred by some poor judgement. Since I still do not own the 3-quart baking dish always called for in these recipes, I had the bright idea of just mixing everything together in the enameled cast iron Dutch oven in which I had boiled the elbows, and baking it in that. What I failed to consider is that the Dutch oven was not properly buttered, so my macaroni ruthlessly clung to the sides and bottom of the pot. I practically had to chisel it out after baking it, and who knows if the pot will ever again be truly clean. Poor Sunshine (yes, my pots have names too). I didn't taste the teaspoon of dry mustard at all, and since it was the only spice besides salt, I really expected to notice its presence. If I make this type of mac and cheese again (and I will, because I am an eternal optimist as well as an expert recipe tinkerer), I will cook it in a shallower, well-buttered pan and add a little more milk than the recipe suggests, so that the milk comes all the way up to the top of the mac. I'll also cover it with foil for most of the baking time, in an effort to keep the top from drying out. Believe me, it looks better than it tastes, and only from a distance. When I reached the bottom of the bowl I found a fluorescent oil slick that made me feel vaguely queasy and actually inspired me to put on my sneakers and get some exercise. So I guess that's not a bad thing. But this mac recipe isn't a decisively Good Thing either. Cook at your own risk. Take lots of liberties with this recipe. I think it's probably a decent jumping-off point. Edited to add: Unlike most macaroni and cheese, the Reagan mac is much improved by microwave reheating; I think the steam inside the vented container helped to soften the too-crusty parts. And, since I know you're dying to find out: Sunshine the enameled cast iron pot cleaned up like a champ after soaking overnight. Phew! 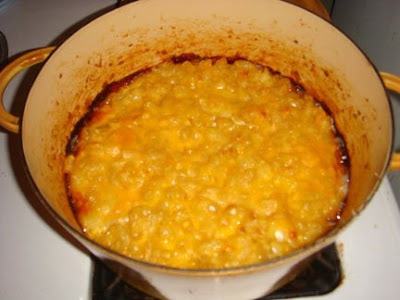 Preheat oven to 350 degrees F. Boil macaroni in water until tender; drain thoroughly and return to cooking pot. Stir in butter and beaten egg. Mix dry mustard and salt with hot water until dissolved; add to macaroni and stir well. Add most of cheese, reserving some for topping. 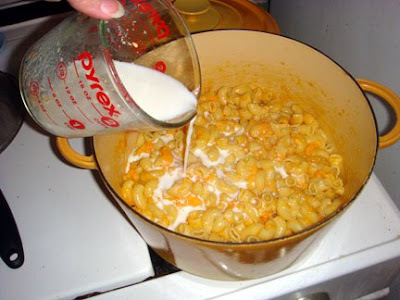 Pour macaroni mixture into a buttered casserole. Pour milk over top; do not stir. Top with reserved cheese. Bake for 45 minutes or until custard is set and top is browned. I've made this recipe twice... bothe times the cheese stuck together in clumps and the rest of the mac was held together with mustard custard. I'm trying something different today. I mixed all the ingredients together in the pot with the cooked mac over heat. 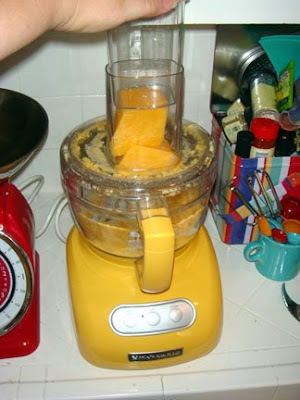 Stirred until the cheese melted and then poured that into a buttered casserole dish. Sprinkled cheese on top... it's now in the oven. If this doesn't work.. I give up on this recipe.